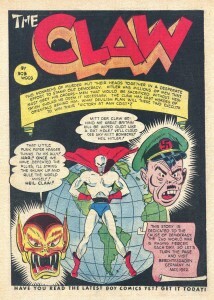 Daredevil #10, 1942 – The Claw & Hitler vie for power. This project will investigate the varying depictions of the Axis powers in World War II era American comic art. While this topic can arrive with many, partially correct assumptions–that enemies were vilified, dehumanized, and transformed into grotesque characters worthy of hate–there is still much to be gained from examining these images for their subtle, perhaps missed differences. The question I am asking of such comics, and in turn their audiences and creators, is in what specific, categorical ways were America’s enemies portrayed? This question will obviously deal with the physical images themselves (their artistic content, quality, and historical context, etc. ), but will also allow for larger discussion of their intended message. What were Americans, on the home front and abroad, meant to feel towards their foreign enemies? How were they expected to view the war itself, and its assumed goals? By asking such questions, and by using both primary comic material and academic sources, many unexpected discoveries are made. Clearly from the outbreak of war to its conclusion the Axis were shown as great antagonists, but at times these portrayals could stray far from anything uniform, static, or even complementary. Through this project, I will argue for the variety and complexity found in American comic art’s depiction of foreign enemies. I will examine how these images changed, offered competing images, and how by examining them, we might better understand popular opinions of the time. This analysis will cover both Japanese and German populations, and will not only focus on the inner intricacies found in the representations of both these peoples, but as well the greater differences between the two. This will include such topics as showing the Japanese as simultaneously incompetent and experienced fighters; the overarching presence of racism in the Pacific theater; the primacy of the European war effort; and the more nuanced depictions of Germans early in the conflict. Over the course of this research, I hope the diversity of enemy comic depictions will be made clear. I aim to show the fluidity of comics as a war-time medium, and how even in the short span of 1941-1945, their content and messages could drastically change; whether by natural shifts in attitudes of audiences and authors, or by a government that was interested in a new, viable form of propaganda. The comics I will be citing include supporting selections from many popular publications (Captain America, All Stars, etc.) but will rely more heavily on two individual series: Daredevil & The United States Marines. These were chosen for reasons of availability, run of print, and wealth of content. Daredevil is particularly useful for its inaugural appearance in 1940, and with its wartime narratives taking place in both the Pacific and European theaters. The United State Marines is excellent for a study of depictions of the Japanese enemy and perceptions of the Pacific, being joint-published by the U.S. government, and filled with ‘true-to-life’ stories of the brutal campaign. To further analyze these works, I have also engaged secondary materials which focus on peripheral or supporting topics: the nature and role of comics as a historical medium; wartime racism and racial images; and the U.S. government’s involvement in propaganda. Through these efforts, I mean to offer perhaps overlooked dimensions of comic art, and the true complexities found therein.